This story first appeared in Midwest Energy News and is reproduced with permission. As the oil and gas industry pushes for new laws exempting information about pipeline infrastructure from being released to the public in the name of national security, advocates say doing so could actually increase the risk for everyone. And the lack of public knowledge about these issues – which extends to other kinds of energy infrastructure, like rail transportation and transmission lines – can place an even heavier burden on ill-equipped government regulators. In Michigan, a dozen House Republicans sponsored a bill last week to amend the state’s Freedom of Information Act law to exempt “critical energy infrastructure information” from being disclosed, more than a decade after Congress approved similar federal rules in the wake of the 9/11 terrorist attacks. The bill sponsor and industry representatives say it is necessary to model a state law after existing federal rules to protect from outside threats, and comes as state agencies begin taking more of an active role in pipeline oversight here. 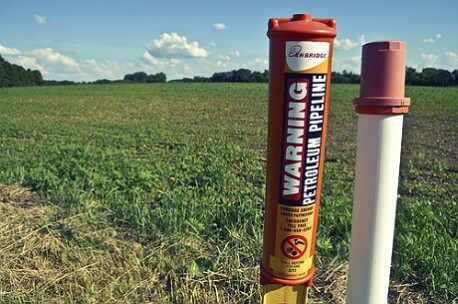 In Michigan, pipeline safety is a major issue. In 2010, an oil spill from an Enbridge-owned pipeline near Kalamazoo leaked more than a million gallons into a nearby watershed, the largest inland oil spill in U.S. history. Recently, natural-resource advocates have drawn attention to a 62-year-old pipeline through the Straits of Mackinac, a pipeline also owned by Enbridge. The risk of an oil spill there and the modeling of what could happen if it were to rupture has become a rallying cry for Great Lakes protection. Multiple state agencies – led by the Attorney General’s Office and the Department of Environmental Quality – have formed a task force to look specifically at these safety issues and will issue a report in the near future. A spokesperson said the Attorney General’s Office is still reviewing the proposed bill. HB 4540 critics say these are reasons the public needs more disclosure about pipelines, not less. They question the need to emphasize national security and promote secrecy instead of the public’s ability to access safety information on the infrastructure around them. They also note the proposed rules appear to be more restrictive than federal ones. Industry groups were closely involved with developing the bill, which was introduced by Republican state Rep. Kurt Heise and co-sponsored by 11 other Republicans. “The bill would keep sensitive information out of the hands of bad actors who seek to potentially harm Michigan and citizens here,” said Enbridge spokesman Jason Manshum. Paul Blackburn, a Minnesota-based attorney and board member of the national Pipeline Safety Trust, said the bill would end up doing more harm than good. “The oil industry has sought special treatment in information policy claiming that anything related to them is so secret that everything should be kept from the public,” he said. “The concern I have in seeing pipeline safety problems is that secrecy could very easily result in self-inflicted wounds, meaning that if the only people who know about pipeline safety are the oil industry, government regulators are essentially captive at this point. Moreover, Blackburn says the terrorism claims are overblown. “There has never been an attack on a U.S. pipeline. But they’re saying that the risk of terrorism is so great that the public shouldn’t know anything about safety and should trust the industry and government. “There is a balance here. Having the government and citizens involved actually increases safety because it holds companies accountable to comply. On the other hand, the risk of terrorism is uncertain. Having information about the safety and implementation of federal safety laws isn’t going to help terrorists. Terrorists don’t want to know if there is an anomaly of corrosion in a pipeline somewhere,” he said. Blackburn called industry claims that he’s heard about only providing the general – or even exact – location of pipelines “ridiculous,” because they are mostly mapped and easy to find online. “It’s like saying the Pentagon is a secret. It isn’t. They just say it is as a way of making even the most general information about pipelines a secret,” he said. There appears to be a dispute between the industry and opponents over what, exactly, the language exempts. Griffin said HB 4540 is meant to “mirror federal law in that certain things like designs, schematics, blueprints and very detailed information that if it’s deemed to be critical energy infrastructure could be exempt from disclosure to the public. “That doesn’t mean [state agencies] don’t have to disclose locations, information about infractions that may have occurred or enforcement actions” against a pipeline owner, he said. James Clift, policy director for the Michigan Environmental Council, said his organization opposes the bill as drafted because, unlike federal law, it doesn’t offer “bypass mechanisms” to the information for nearby landowners or interest groups who might be directly affected by pipeline safety. He called it a “blanket exemption with no bypass whatsoever” and that it appears to broadly define “critical energy infrastructure” in a way that excludes things like inspection reports and what kind of shut-off valves are being used. Holtz, of the Sierra Club, said it goes “far beyond” what is protected under federal rules. Griffin disputes claims that the bill is in response to increased attention to the Straits of Mackinac, but he did say that it would provide clarity to state agencies about what information it could release. Clift said there appears to be concern from the state level that if it is tasked with more pipeline safety oversight in the near future that it has the same FOIA protections that are granted under federal law. Andy Balaskovitz reports for Midwest Energy News where this story first appeared.